The human consciousness must be sublimated, transformed and replaced by the spiritual and divine consciousness. The suffering is an inseparable intrinsic attribute and substance of the normal human consciousness. That is to say, as long as we are human with the human consciousness, the suffering is inevitable. True happiness, delight, ananda is an attribute, an intrinsic dynamic principle and substance of the spiritual and divine consciousness. Unconditional, unalloyed, ever present, luminous joy is inherent in the spiritual and divine consciousness, its very substance. It is only by the discovery of the divine consciousness and by the gradual and increasing union with the Divine that we become ultimately free from suffering once for all. The suffering is the inevitable result and consequence of all our inferior human attributes, qualities and actions and of unillumined movements of mental and vital consciousness. Desires, search and satisfaction of pleasures, greed, jealousy, ambition, search for power, position and name, falsehood, self assertion, anger, cruelty, violence, all these elements are natural attributes of the human consciousness and they cannot be eliminated or suppressed, controlled by the mental vital effort alone. By high spiritual powers, high spiritual consciousness, they are refined, controlled but not eliminated. Only the grace of the Mother Divine, the supramental consciousness, the divine consciousness, gnosis has the absolute power of transmuting them into its own substance of force, delight and consciousness, its inalienable unity and oneness. Man must become divine in order to be entirely free from the mental, vital consciousness and its natural attributes and qualities. That means, to be entirely divine, his mind, life and the body too must be divinised. Even if we attain spiritual peace and calm and other higher realizations our body remains subject to pain, thirst, hunger, disease, decomposition and death. Even in the Vedas, we find recorded such facts. So, to be truly happy, we must have a body free from pain, thirst and hunger, fatigue and disease, degeneration and if possible death, at least, accidental death, that is to say forced or unwilling exit from life. Death too must become a willful act of the soul, not imposed on us. It is here that the yoga of the Mother and Sri Aurobindo is fundamentally different from the traditional spirituality in India and elsewhere. Because a real way of divinising mind, life and especially the body could not be found, the solution of illusionism was adopted, which completely paralysed life and eventually all spiritual endeavour. To be really happy, we must have a divine body, transformed radically in its form and function, in its very substance and constitution. Up till now some yogas have attempted to achieve the physical immortality. In ancient Egypt the attempt was made over thousands of years to find the secret of physical immortality, which they achieved but in a sad way, through mummification of dead bodies. In Greece, there was an attempt to find physical perfection and beauty and harmony. In ancient China, Japan, there have been various attempts of prolonging the life of the body through physical and spiritual means, specially by bringing a universal calm and tranquility and peace in their mind, life and body. 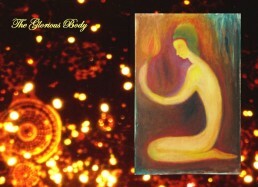 Though man has always dreamed of an immortal glorious body, in actual practice in all these attempts, we find that there is no conception of transforming the actual body and its functionings, but only an attempt of prolonging the life of this body as it is, probably with a little refining of its actions, reactions and functions. The Mother and Sri Aurobindo tell us that if we can get in contact with the divine consciousness beyond mind, the supramental truth consciousness and open ourselves to the supramental divine Shakti, then she will gradually transform our mind, life and finally the body into a divine mind, a divine life and a divine body. Through much experience it has been found that the body of an aspirant, though animal in its character and origin, can open and receive the divine Shakti far more easily and with greater positive consequences and effecti vity than the mind and the vital part in an ordinary man can do. Since we are primarily embodied souls, that is to say, our soul, mind consciousness, vital consciousness are expressed or manifested through the body, the body itself is the expression of the soul and the mental and the vital consciousness in evolution. So, if we can open the body directly to the influence and power of the divine consciousness, the body will necessarily be transformed though gradually and extremely slowly by the descent of the higher consciousness into the body. The mental and the vital powers and faculties can be considered as attributes of the present body and if the transforming divine Shakti comes in the body, they too will be necessarily transformed. The mental and the vital consciousness in man being nearer to the subtle substance of the divine consciousness can and will undergo a relatively quick transformation. The body though it is more receptive has been built on such a solid and stable basis, that transformation may take centuries. Though once started the process will lead to the final result inevitably, if that be the intention and destiny of the individual soul.